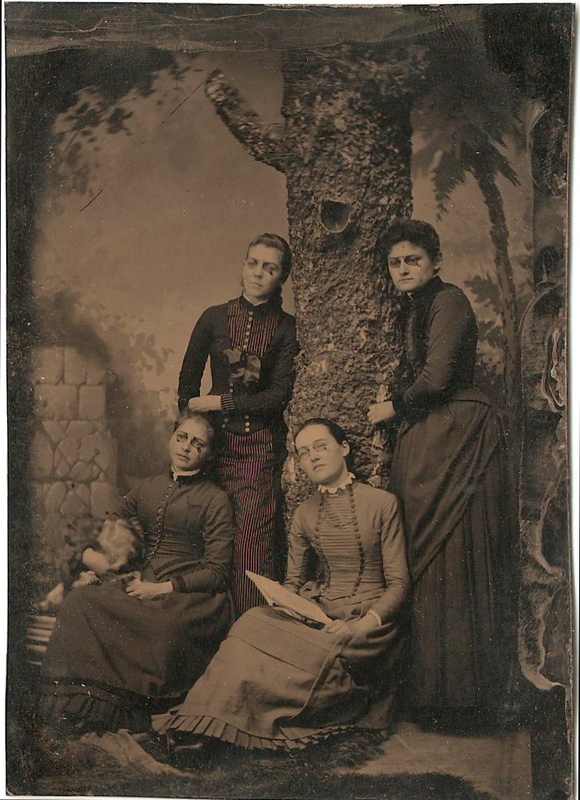 A close look at this photograph reveals something rather unusual: all four women wear pince-nez spectacles.1 In addition, one appears to clutch a writing tablet of sorts, lending a studious air to the scene despite the blur of a moving animal at left. Although these four women have posed for a tintype, which might lead one to believe that it was taken before card photographs exploded in popularity, this image can in fact be dated to the late 1880s. Four unidentified women wearing spectacles, likely Mount Pleasant, Henry, Iowa, ca. 1885-1890; digital image 2012, privately held by Melanie Frick, 2014. There are other possibilities. As Exsie is an unusual name, I decided to search on Ancestry.com for young women named Exsie who might have resided in Iowa in the 1880s. A stroke of luck revealed just one – Exsie B. Sayles, who was a resident of Mount Pleasant as of 1885.6 A local history page shared that Exsie was a member of the Mount Pleasant High School graduating class of 1886, along with, notably, Franc Pitcher, Laura S. Mitts, Mary Wright, and a handful of others. 7 Mollie can be a nickname for Mary, so could these be other contenders for the women in the photograph? Although Laura B. Smith was not named as a graduate, school records may provide additional clues. One might assume that these women had the specific goal of appearing scholarly for all to agree to be photographed in their spectacles. It seems likely that they were friends or classmates; perhaps they were celebrating an educational achievement, such as their high school graduation, or were acknowledging their involvement in an intellectual club of some kind, such as a literary society. No matter the occasion, this tintype offers a suggestion of the women’s personalities and interests, as well as a fun look at stylish vintage eyewear. 1 J. William Rosenthal, Spectacles and Other Vision Aids: A History and Guide to Collecting (San Francisco: Norman Publishing, 1996), 244; digital images, Google Books (http://books.google.com : accessed 14 March 2014). 2 Joan Severa, Dressed for the Photographer: Ordinary Americans and Fashion, 1840-1900 (Kent, Ohio: Kent State University Press, 1995), 430. 3 Severa, Dressed for the Photographer, 418. 4 Jesse M. and Elizabeth Jane (Baker) Smith Album, ca. 1860-1920; privately held by Melanie Frick, 2014. 5 1870 U.S. census, Henry County, Iowa, population schedule, Center, p. 14, dwelling 109, family 109, Laura B. Smith; digital image, Ancestry.com (http://www.ancestry.com : accessed 14 March 2014), microfilm publication M593, roll 395. 7 Pat Ryan White, “Mt. Pleasant H.S. Alumni, 1911,” Henry County, IAGenWeb (http://iagenweb.org/henry/Schools/1911mpalumni.htm : accessed 14 March 2014), entry for Exie [Exsie] Sayles. This entry was posted in Photograph Analysis and tagged 1880s, family history, genealogy, Iowa, unidentified photograph on March 14, 2014 by Melanie Frick.